With the cost of energy on the rise, many home owners are cutting firewood to heat their homes. If you decide to heat with wood this winter one question to ask yourself is.......how will I get my firewood? Well you basically have two options, cutting it yourself or buying it from someone else. Cutting firewood yourself can give you a feeling of pride and accomplishment knowing your hard work has contributed to keeping your house warm for a relatively low cost. However, cutting your own firewood can be exhausting and dangerous. Like they say, cutting firewood should warm you twice. Once when you cut it and once when you burn it. Buying your firewood is obviously much easier but it will reduce the amount of money you're saving by burning wood. I myself have done both. I always try to cut my winters supply of firewood myself but sometimes I just run out of time. Buying a full years supply of firewood can be fairly expensive depending on how much wood you need for the year. One option is to buy firewood by the semi load and then cut the wood yourself. The picture above shows a load of hardwood that I purchased from a local logger. 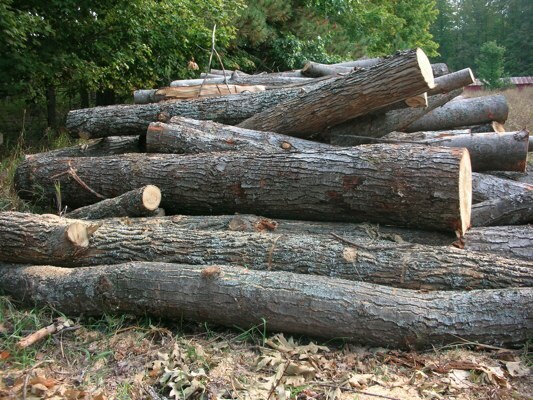 Read here for tips on cutting firewood by the semi load. Okay, so you've decided to cut you own wood. The first thing to learn is firewood cutting safety. After all, your safety is paramount so don't hurt yourself by being unprepared. Harvesting firewood requires the use of dangerous machinery that could easily cause injury or death. Knowing how to properly operate the machinery and wearing the right safety equipment can help keep you safe. Read here to learn more about firewood cutting safety. A pinched chainsaw bar is a common problem when cutting firewood that's both frustrating and dangerous. Typically as you cut up a tree that's laying on the ground into firewood, the weight of the tree will cause the log to close up on your saw......especially when you're making a downward cut. 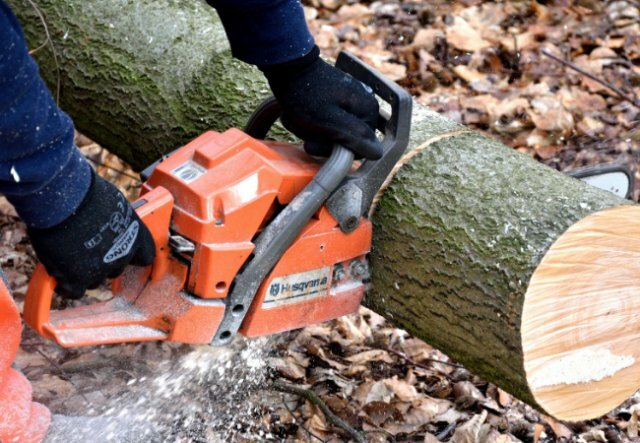 To prevent this from happening, read this article that gives a few tips to prevent your chainsaw from pinching as you process the log into firewood. The most common, widely used piece of equipment for firewood is the chainsaw. Chainsaws come in a variety of makes and models. Choosing the correct chain saw type will depend on how much wood you need to cut and where the wood is located. Read here to learn more about chainsaw types. Cutting up a tree is only half the battle. Once cut, the wood needs to be transported from the woods to your truck or trailer. Moving the firewood from your storage shed to your home or furnace can also be labor intensive. A firewood cart can make the process much easier. Read here to learn more about a firewood cart. For the serious firewood enthusiast, a firewood processor can produce mass quantities of firewood. The machines are large and expensive and are not the right choice for everyone. Read here to learn more about a firewood processor. Do you handle a lot of firewood or have your own firewood business? Read here for information about a firewood conveyor. Felling or cutting a tree can be dangerous and deadly. Read here for an overview on felling a tree. Choosing the right tree for firewood is also important. Which trees make good firewood? Where can you find firewood that's easy to get to and easy to cut up? Read here to learn about choosing trees for firewood. It's not uncommon to cut into a piece of wood and find out it's rotten. Should you burn rotten firewood? Read here to find out. Using a sawbuck will allow you to cut longer logs and limbs into smaller pieces. 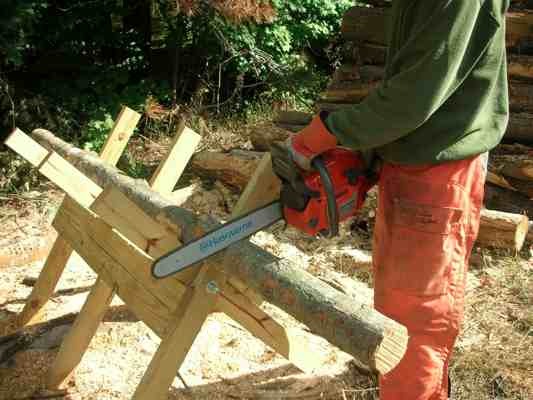 The sawbuck elevates to wood off the ground creating a stable base and it prevents your chainsaw from hitting the dirt. Read here for our sawbuck plans or to make things easier you can download our sawbuck assembly instructions. Many states also allow you to cut firewood on state and federal land. This can be a good source for firewood if you don't own property that contains a lot of trees. Find out what firewood permits are required to cut firewood on state or federal land. What's The Best Time Of Year To Cut? When's the best time of year to cut firewood? Typically, most people would agree that harvesting firewood in the spring in the best, but what about the other months? Can you process firewood in the summer, fall or winter? Read below to learn the advantages and disadvantages of cutting firewood in each season.